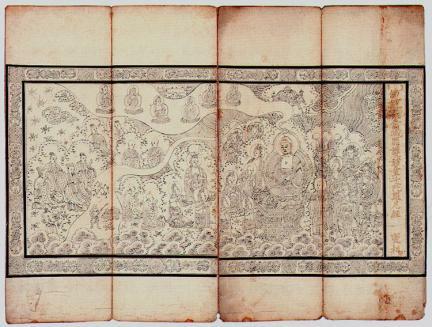 This transcription of Buddhist Sutras has been handed down to Gwangdeoksa Temple in Cheonan, Chungcheongnam-do. 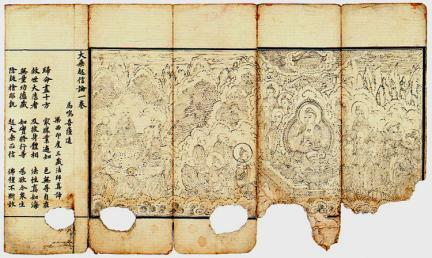 These Buddhist Sutras, consisting of Bumo eunjunggyeong (Parental Love) and Jangsu myeoljoe hojedongja daranigyeong, were written on white paper with black ink and were made into a foldable accordion-like style. Bumo eunjunggyeong explains our debt to our parents by dividing it into ten cases, asking us to offer food to Buddha and memorize the Buddhist scriptures to repay our parents’ favors. 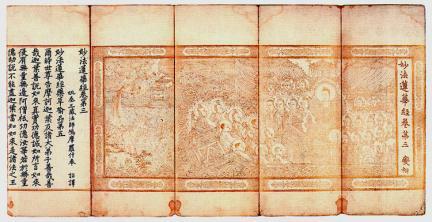 Unlike other Buddhist scriptures, it has several illustrations on the contents of each part. Jangsu myeoljoe hojedongja daranigyeong is a Buddhist scripture teaching us how to get rid of all evil and sins and live long and happy by practicing Buddhism or with the power of Buddha. 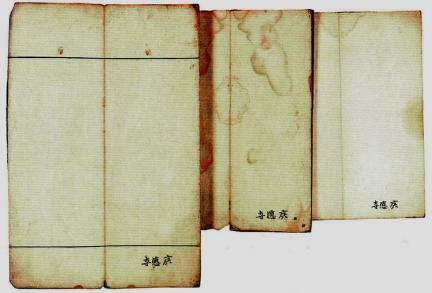 The record at the end of Bumo eunjunggyeong states that the book was published with an offering from Prince Hyoryeong, the second son of King Taejong of the Joseon Dynasty, and his son and wife. From the book, we can learn that Prince Hyoryeong’s strong belief in Buddhism played a big role in promoting Buddhism in the early Joseon Dynasty. This book is considered to be very valuable in studying the history of Buddhist culture in Korea and bibliography.